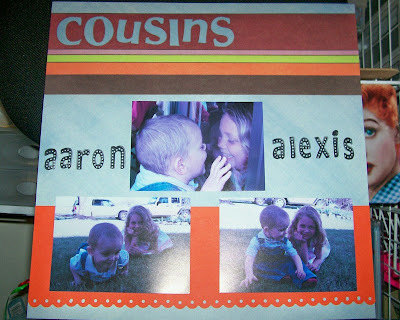 Here is a layout of Aaron and one of his favorite people-his cousin Lexy. Sorry the photo is so bad-I have such a hard time getting a decent pic in this house! Everything looks crooked, but its not in real life (I even double checked! ), its just the way I had the page. The "cousins" paper was from Reminisce-I just LOVE their papers! They're one of my favorite companies! I also used my threading water punch for the very first time! YAY! The letters are Scrappy Cat Stamps that I got from M's the other day for $2.99 plus 40% off! What a deal! I love those alphabet stamps! So cool with the circles! Awesome page! Love your use of the threading water punch too! I just love that punch! 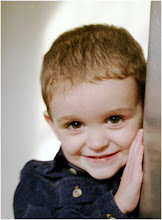 CUTE photos!